Is the dog really man's best friend? The WRPG genre has seen heavy competition this generation with the return of Fallout and the start of promising new IPs like Mass Effect and The Witcher. 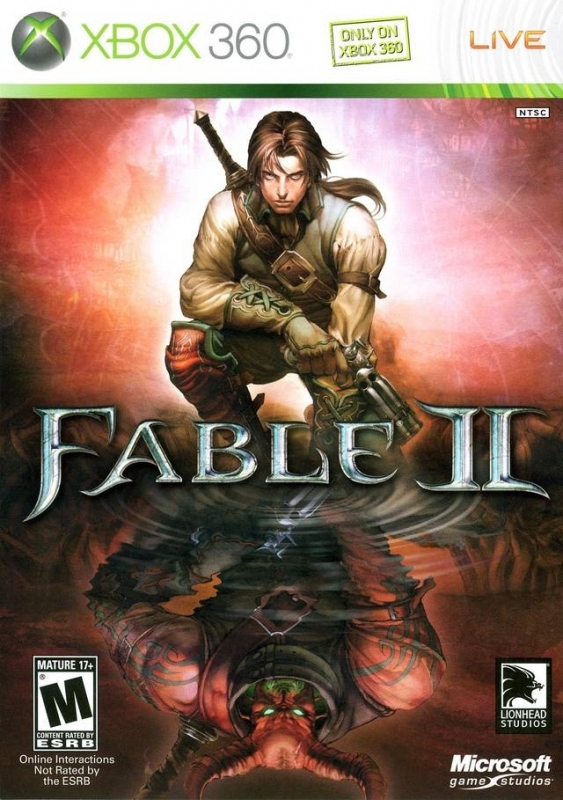 Enter Fable II, Lionhead's much trumpeted sequel to their 2004 Xbox hit. 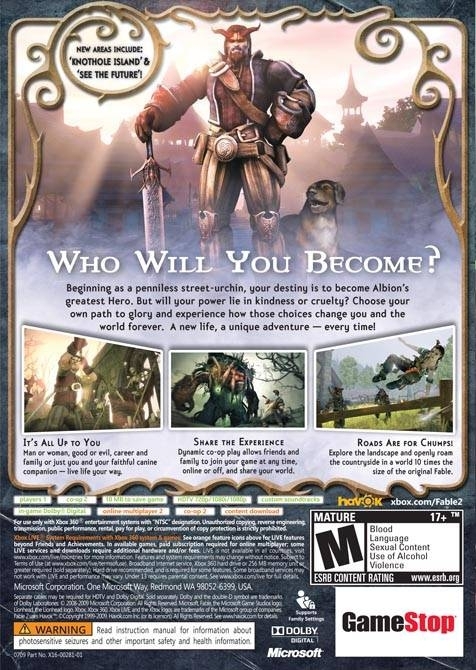 Fable, while undoubtedly a good game, ended up failing to deliver on many promises. 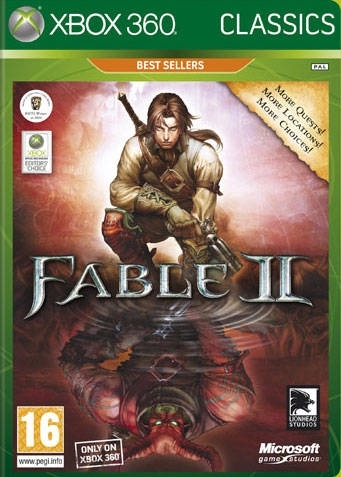 Does Fable II suffer the same fate, or has Peter Molyneux redeemed himself? 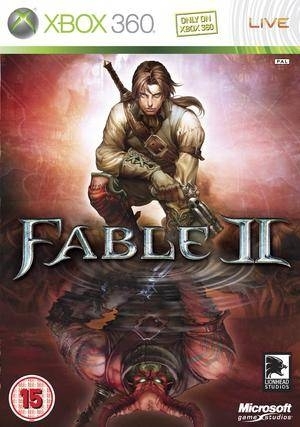 You begin Fable II as a young orphaned beggar living with your sister, Rose. The game has you perform little odd-job quests around town to get enough money to buy a small magical box that supposedly grants one wish. After completing the quests, the Hero and Rose buy the box, and wish to live in the castle. They are surprised to find they are summoned by Lucien, the King of the town, and even more surprised when he turns on them. The Hero wakes up later to discover he has been saved by an old blind seer named Theressa. 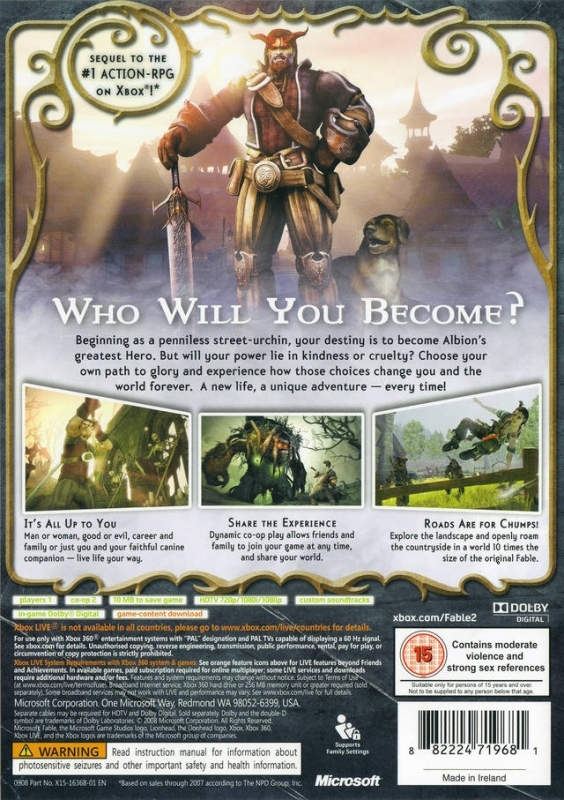 The game fast forwards to ten years later, when the hero sets off on his journey to find the 3 other heroes of legend and get revenge against Lucien. The story is fairly predictable. It has a couple minor twists and unexpected moments, but generally there is nothing special in the narrative department. The pacing feels a little off at times, and the game's ending is pretty awful. I say the game's ending is awful, but what's really awful is the game doesn't have an ending. It just stops at one point. Everything you worked for throughout the game is finished in the course of a 30 second conversation that you only make one choice in with no final boss fight. It feels very rushed. That said, the event right before the final confrontation is neat, and a creative use of non-combat gameplay in a game that was mostly focused on combat. 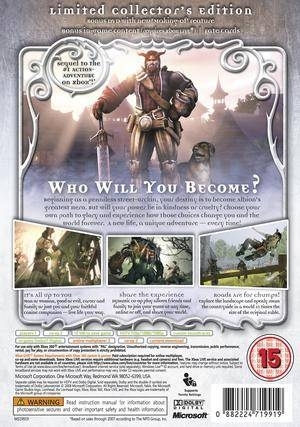 The game's main selling point of having difficult moral choices suffers from the same affliction as its predecessors that have attempted this mechanic. The choices are all black and white. 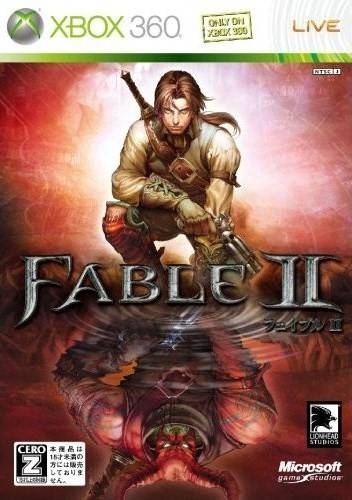 One advantage Fable II has in that department though is that while it's always easy to tell what the "good" choice is, it's not always easy to make that choice. Clear, negative, and permanent consequences for your character force you to consider your decisions carefully. There are only a couple choices in the game like this, and it's too bad because they really are great. 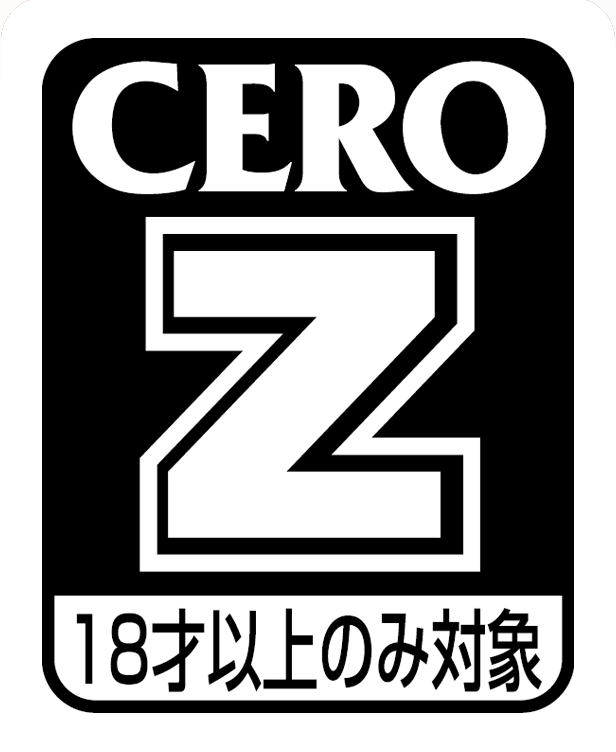 The last choice of the game is especially difficult, and had a strong enough consequence that the good choice made me no longer wish to continue playing the game. Which could be argued as either good or bad, but personally I enjoyed this bit. All that said, the developer's claims that the choices should really let your character reflect who you are are pretty bogus. Unless you are a murderous, greedy psychopath or a saint without character flaws I don't think the game is going to manage to mimic your actual personality. The choices were just too simple. 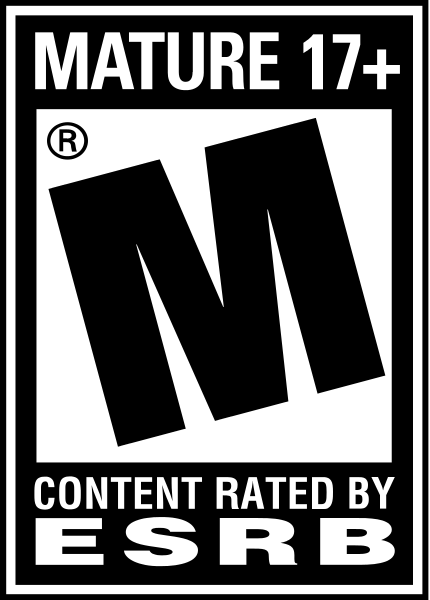 The other main feature of the game is player and world interaction. This was promised through companionship with a changing pet, the dog, and a world that evolves with the player's decisions. The dog is a pretty simplistic AI. It finds treasure, and helps in combat (sort of) and gets scared and needs to be comforted. You can play with it and teach it tricks. The more tricks it knows the more it will do while your character is using his emotes, increasing their effect on the opinions of NPCs. It ends up being a decent companion in the end, but not a game-changing one. It would be nice if it was more useful, but it does serve a purpose. 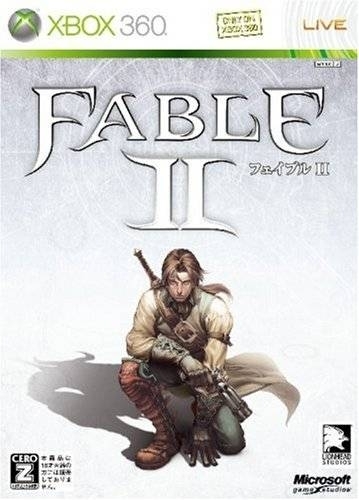 Fable 2's changing world ends up as a hit and miss. While your actions have a clear effect on the world, major changes to the world only happen at a couple scripted points within the game. These changes will be different depending on the choices you made before those scripted events, but there is only so much that can happen on a large scale. On a smaller scale you can change a lot. For example, you can change a town's economy by buying up businesses in the town and setting the prices. Reasonable prices will improve the economy, high prices will drive the town into poverty. Different people of different social class appear depending on the economy. This is a pretty neat feature, and overall it's handled well. While there is a lot of room for improvement, you do feel rewarded for your decisions. Unfortunately, NPC interaction is not as well-done. It's incredibly easy to make any character fall in love with you. In fact, my hero looked so good I made every woman and gay man in town want to marry me just by walking around. 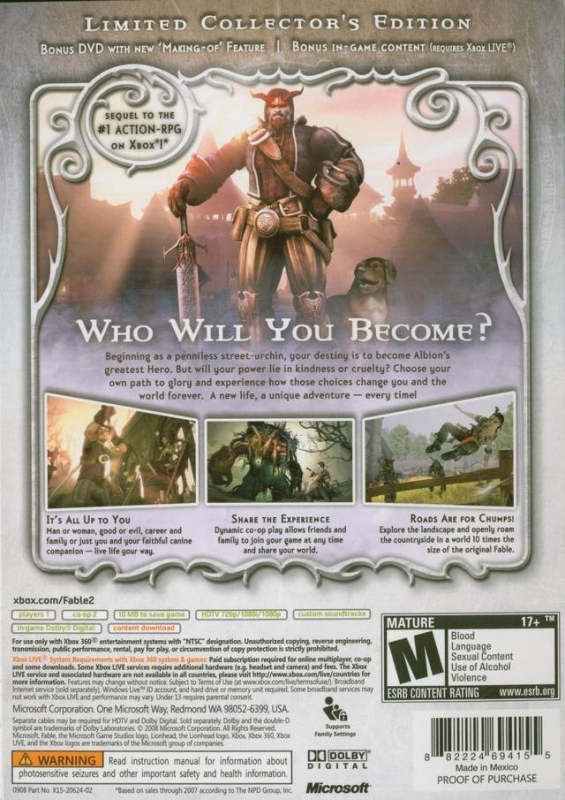 Fable II wins some points for allowing any sort of partnership regardless of sexual preference; one of the better features of its predecessor. Those that don't fall in love with you just by looks are easily manipulated by the use of simple emotes. Your player dances, plays an instrument, flexes, whistles, or completes other simple and silly actions. If you, for some reason, are still having trouble making an NPC fall in love with you, you can actually check the details of the character and see what emotes and gifts they like. This takes any real challenge out of dating and marriage in the game. Raising a family, however, is still pretty fun, and I did like going home to my fake wife and kids. It also made me want to constantly look for bigger and better houses for them to live in. With all the interaction out of the way, we now get to the combat. This is either the strongest or the weakest point in the game depending on your point of view. The Hero can utilize three different types of combat: melee combat, ranged combat, and magic. Each one is completely unique from the other, and each one has its own set of experience points. As you fight, you gain more experience in each type based on what type you used the most. You also gain some general experience which can be spent in all three. The three combat types can interact with each other in great ways. Magic is especially versatile in combination with the other attack types. Unfortunately, combat is just way too easy. Magic lets you slow time, teleport behind people, and do other things that make an already easy mechanic child's play. Even the toughest time trial event in the game, The Crucible, can be beaten without much difficulty. With only two different types of boss fight in the game (and even these are rare), you really never end up challenged. If you do take the time to learn the more complex ways to chain together your abilities, you will find the combat system to be a blast to play and full of variety, but nothing really ever lives long enough to do so. The co-op is a nearly worthless addition to the game. You cannot bring your own character into a friend's game. You have to play a generic premade character. The camera angle is fixed, and only the hosting player can adjust it. This means that it's nearly impossible to get anywhere without one player getting stuck, which then ends up not letting either player progress. What is cool, though, is seeing your friends wandering around the world in the form of floating spheres when you play on Xbox Live. You can give gifts and interact with them when you run into them. 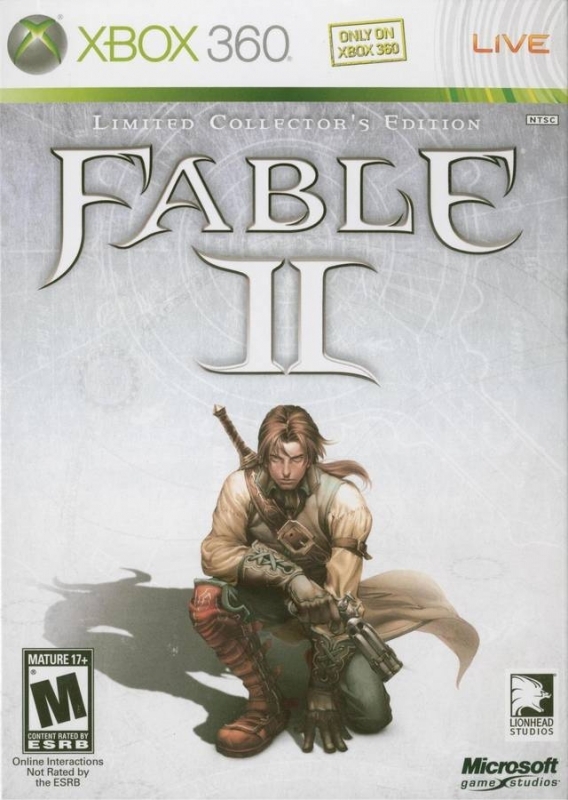 It's a neat addition overall, but Fable II is still really only a single-player experience. 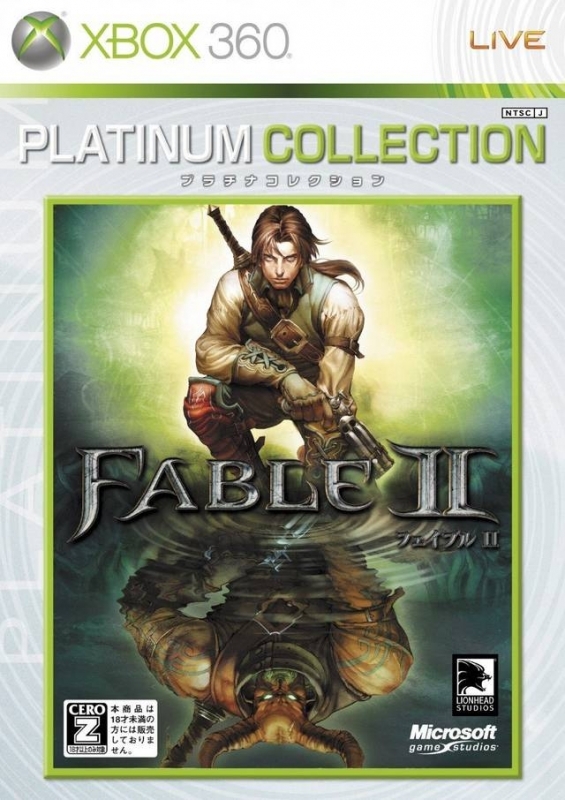 Other issues aside, Fable II is beautifully presented. While not impressive from a technical front, the artistic design of the world is top notch. Golden fields, green pastures, and towns ranging from pirate villages to sprawling cities make for all the eye candy you could want. To make things even better, just when you think you are getting bored of the visual design the game does one of its scripted world changes. Spring becomes fall, new towns rise, and old towns change. There are really only two things holding the visual design back: character models and crashes. The character models are incredibly ugly, and there are shamefully few NPC models in the game. Often you will walk into a town and see a dozen clones of the same NPC model. Their animation is stiff and emotionless. Even your character looks pretty bad. He either mimics a Disney hero or a Disney demon, and there aren't really enough clothing options to make him or her unique. The crashes, however, are inexcusable. The game crashed on me numerous times, once corrupting my save file (thankfully very close to the beginning of the game). Since you can only have one save file (obviously a feature designed to make your choices more permanent) the crashes can completely ruin the game for some people. 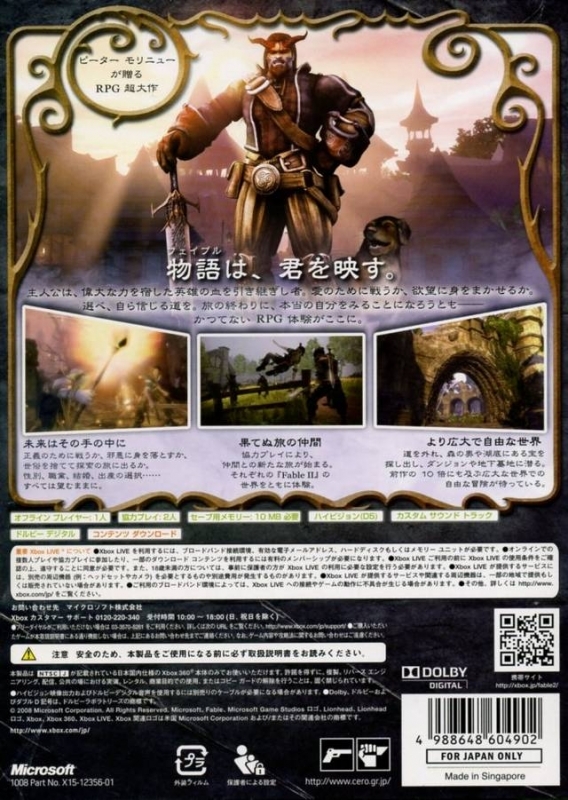 There is also the occassional bite of screentearing and slowdown, and sometimes the gold quest trail gets confused. 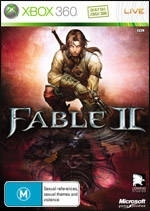 From an audio standpoint Fable II is very good. The voice acting is great. 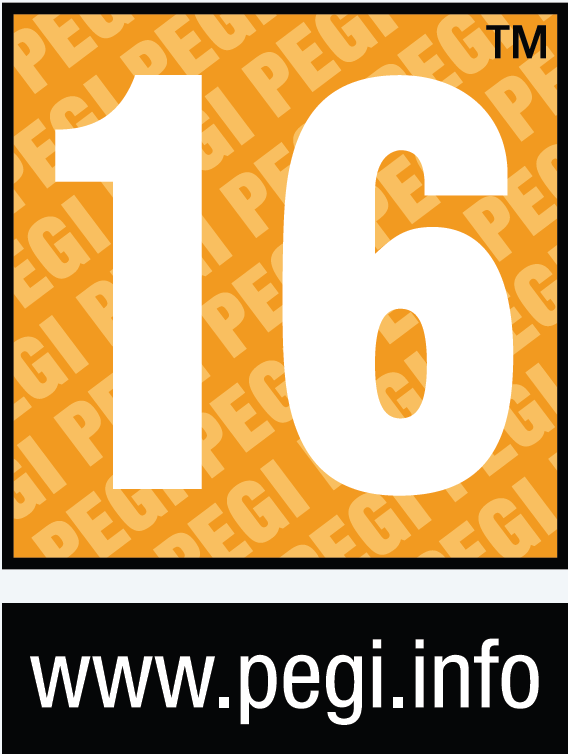 In fact, it is among the best in the industry. Music is pleasant and atmospheric, but there should be more of it. The same song will repeat a little too often by the end of the game. The one major audio issue is with the NPCs. They continually repeat the same couple lines, and it gets pretty annoying eventually. I found myself actually avoiding towns at one point near the end of the game just because I didn't want to deal with the people flocking around me and repeating the same phrases. 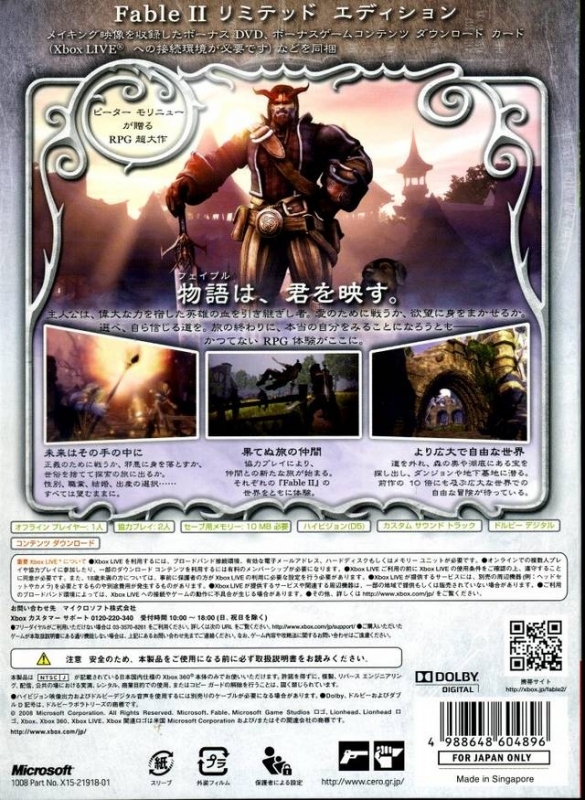 While your mileage may vary depending on how much you like the combat, there is a lot to do in Fable II. The main story can be completed in about 15 hours, but there is a lot of other content to keep you entertained. Getting jobs, buying businesses, seeking out new and better houses, and interesting quests keep the game going long after the plot is finished. With both good and evil playthroughs and all the content in Albion, a dedicated adventurer can easily spend 60 or 70 hours playing around the magical world. There are unique quests that you won't get (or be able to do) on the evil side if you are good and vise versa, so a second playthrough is an enjoyable and different experience. 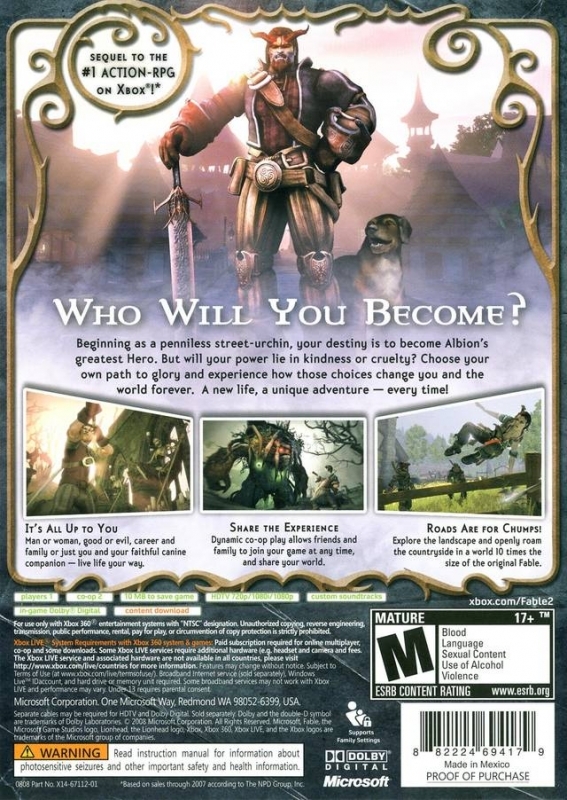 Fable II is sort of a mixed bag. The plot has its moments, but falls apart at the end. While there are a couple of great choices in the game, most of them end up being the same black-and-white choices that have plagued choice-driven gaming since its beginning. The combat system has a lot of depth, but it doesn't meet its potential thanks to a low and unchangeable difficulty level. Even the great presentation is marred by extremely poor character models, crashes, and too many repeat uses of the same models and dialog. 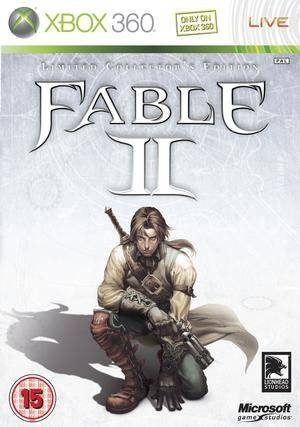 All that said, Fable II is a fun game to play, and with dozens of hours of gameplay available, it's a very good purchase for WRPG fans.